Home » Readers and their... » ranch » Pink kitchen. 1965. Cory. I’ve been lurking on your website for several months now, re-awakening my fondness for the things I remember from growing up in the 60’s. I recently started a Facebook page for the subdivision I grew up in, located in South St. Louis County, Missouri… the houses were actually pretty architecturally boring, 864 sq. foot ranch boxes, but all had the typical 50’s fixtures since they were built in the mid-50’s. 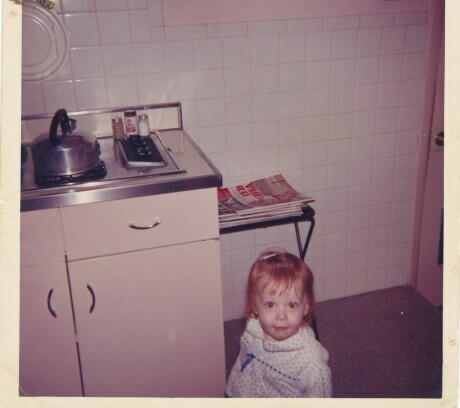 I had a pink bathroom in our house (and am a fan of your website) but thought I would send you this photo that I scanned in for my Facebook page since it shows the pink, steel kitchen cabinets that we had! And yes, that is me in the photo, about 18 months old, taken in 1965. You have my permission to use the photo if you have the opportunity to do so. I can remember seeing lots of photos of the pink bathrooms that your followers have sent you, but couldn’t recall any old photos of pink steel cabinets! Scanning in the photo, I saw several details that the photo alone didn’t reveal… it looks like the walls were painted pink to match, with the 4″ white tiles as a backsplash! We had just bought the house from another family at the time this photo was taken, so I’m fairly certain this decor was inherited from the previous owners. My mother wasted no time in covering those cabinets with wood grain contact paper! … I’m in the process of redecorating my basement (which is completely 80’s, a decade of decor that I’m not so fond of!) and plan to use a retro theme, more in line with the 50’s and 60’s. I already have my great aunt’s Heywood Wakefield dining room set (danish blonde modern) to go in it! Thanks for all your efforts with the website… its so much fun to visit…and I’ll keep my eyes open for other MCM gems to shoot your way! I also have the same tea kettle, and my mother-in-law also covered her metal cabinets with wood-grained contact paper! I’ll have to dig up a picture of me at the about the same age in front of our (now mine) knotty pine cabinets. Thanks for sharing that!